Heat oven to 325°F. Lightly brush oil in bottom and up sides of 13x9-inch (3-quart) glass baking dish or soufflé dish. Separate dough into 5 biscuits. Cut each biscuit into 8 pieces; arrange evenly in dish. 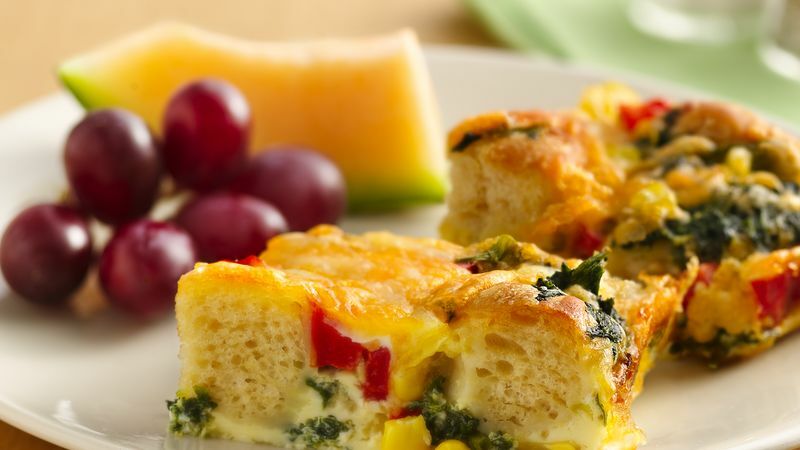 Layer spinach, corn, green onions, bell pepper and 1 cup of the cheese over dough. In large bowl, beat eggs, milk, salt and pepper sauce with wire whisk until blended. Pour evenly over mixture in dish. Bake uncovered 40 minutes. Top with remaining 1 cup cheese; bake 10 to 15 minutes longer or until edges are deep golden brown and center is set. Let stand 10 minutes before serving. You can choose to add 1 to 2 pounds of cooked and drained bulk Italian pork sausage to this bread pudding. Serve with fresh fruit, such as sliced pineapple and raspberries. This twist on bread pudding will remind you of a breakfast dish.